This study day provides physical activity and exercise instructors, teachers and leaders with underpinning evidence and practical applications to increase access and participation for people living with dementia. Pre-course learning activities form part of the essential guided learning hours. You will be issued a password on enrolment to the course. There are no hardware requirements. There are software requirements – the minimum browser version that can be used is: recent Google Chrome(30+), recent Mozilla Firefox(25+), Safari 6, Internet Explorer 9 or 10. Please note we do not recommend using smartphones or tablets for the e-learning work. The 1st Steps face to face one-day course begins at 9.30 a.m. and finishes at 4.30 pm with a maximum of 25 participants. Participants are expected to undertake a professional reflective task Make today Count during the day. Session 1 – People living with dementia and physical activity, planning priorities 1. Session 2 – People living with dementia and physical activity, planning priorities 2. A Dementia: 1st Steps course flyer can be downloaded here. 1st Steps comprises a one-day course programme beginning at 9.30 a.m. and finishes at 4.30 pm with a maximum of 25 participants. Participants are expected to undertake pre-course tasks which are emailed out prior to the course date and also a professional reflective task. All participants are provided with a course support pack which includes sources of additional materials and a comprehensive reading list. Post course, participants are also directed towards additional areas of learning to improve their skills and experience in working with people living with dementia. Learners who have successfully completed all pre-course learning tasks and attended the CPD day, will receive a Later Life Training Certificate of Attendance. 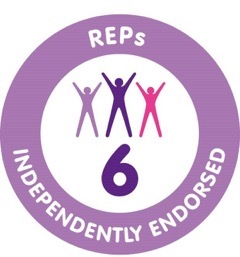 The Certificate states that the learner has been awarded 6 REPs CPD points and has been endorsed by CIMSPA and receives 7 Developmental CPD points. This CPD training course is appropriate for anyone working with people living with dementia (PLWD) in physical activity and exercise participation including exercise instructors, coaches, leaders, therapists, dance and movement teachers. The content is also appropriate for managers of physical activity, exercise and dementia services. This course is not designed for use with volunteers who support people living with dementia. However, Later Life Training has designed specific education and training activities for volunteers working with people living with dementia. For more information, please enquire at the Later Life Training office. Around 800,000 people in the UK have dementia and the cost to the economy is estimated to be c. £23 billion per annum. By 2040, the number of people affected is expected to double with associated costs likely to treble. 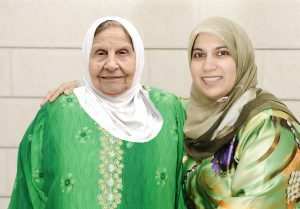 In March 2012, the Government launched the Dementia Challenge – a programme of work designed to make a real difference to the lives of people with dementia and their families and carers. The challenge builds on the progress made in the National Dementia Strategy (2009) and focuses on three main areas for action, driving improvements in: Health and care, creating dementia friendly communities and improving dementia research. More details of the challenge can be here. Dementia is not a natural or normal part of ageing, although it primarily affects people in old age. Each persons’ experience (or journey) is subjective and unique. However, over the last 10 years, a growing body of evidence is emerging that indicates that there is a clear rationale for the inclusion of people living with dementia in physical activity and exercise programmes. “Healthcare providers who work with people with dementia and their caregivers should feel confident in promoting exercise among this population, as decreasing the progression of cognitive decline and dependence in ADLs will have significant benefits for people with dementia and their family caregivers’ quality of life, and possibly delay the need for placement in long-term care settings”. To support Dementia Awareness Week (2017) LLT ‘had a conversation’ with local Alzheimer Society Service User Review Panels (SURPs) in England. 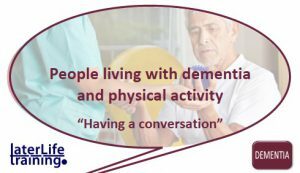 Bob Laventure had a series of informal conversations with people living with dementia about taking part in physical activity. They talked about their views, interests and experiences and the challenges they face in taking up and/or continuing a range of physical activities during their dementia journey.In particular they were asked what would support them in being more active. 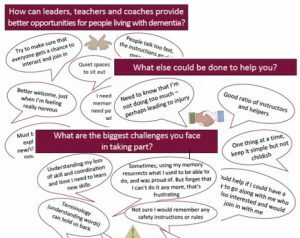 You can download a brief report on our conversations with people living with dementia here. A summary of the most recent evidence on the effectiveness of exercise programmes for people living with dementia. A journal article providing an overview of how exercise instructors and teachers can plan for person centred programing. And professionals from Cambridge, Kirklees and Wigan who took part in the pilot programmes. This training has been endorsed by REPS and PD:Approval (now managing all endorsements previously of Skills Active) and receives 6 CPD points as there is no assessment. This training has been endorsed by CIMSPA and receives 7 Developmental CPD points. 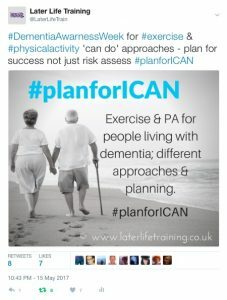 1st Steps in Dementia and the Planning for I Can © assessment tool were included in a case studies in the recently published Alzheimer’s Society’s “Dementia friendly sport and physical activity guide”. To download a copy visit the Alzheimers website. Make Today Count is a summary of the learning from 160 participants who attended the 1st Steps in Dementia Study Days throughout 2018. Reach PLWD – to promote programmes and opportunities. 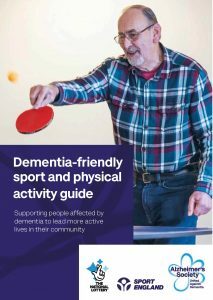 This can be achieved either through direct marketing and promotion or by working with local dementia and other services and partner agencies and in both cases, providing information about the potential of exercise and physical activity and the benefits for PLWD. Increase effectiveness – and the quality of the participant experience. This can be achieved by improving communication and instruction skills and also being clear about the goals and outcomes required to ensure success for both the individual and the programme. Provide support – to PLWD that will enhance and improve the participant experience. This can be achieved by either the increased contribution of the caregiver (known to be important motivators and facilitators towards participation) and/or through the support of volunteers who are in a position to offer one to one and social support. Adopt appropriate principles – moving from Dementia Friendly to being Person Centred. Much recent work has focused upon the importance of Dementia Friendly environments (Communities, spaces and places), but this is only part of what is required to be successful when working with PLWD. Consistent with other work in exercise programming delivery is the dementia care sector principle of Person Centeredness where adaptation, tailoring and application to the individual’s needs are required. As a result of this activity, further tutor and stakeholder conversations, Later Life Training will look to build upon this learning for these and future participants. To download a copy of the report click here. Since the Cochrane Collaboration conducted its original review in 2008, many more systematic reviews and RCTs of exercise for people living with dementia have been published. The 2013 update is now timely and determines what we currently know about the effects of exercise programs on key outcomes as well as on burden, health, quality of life and mortality for family caregivers, and cost of healthcare services. The Cochrane review set out to establish if exercise programs for older people with dementia improve cognition, Activities of Daily Living (ADLs), challenging behaviour, depression, and mortality in older people with dementia. The secondary objectives were to establish if exercise programs for older people with dementia have an indirect impact on family caregivers’ burden, quality of life, and mortality and if exercise programs for older people with dementia reduce the use of healthcare services (e.g. visits to the emergency department) by participants and their family caregivers. The review included 16 trials with a total of 937 participants. Most participants were older people with Alzheimer’s Disease (AD). The exercise programs varied greatly; the length of time that they ran ranged from two weeks to 12 months, and activities varied (e.g. hand movements, sitting, walking, and upper and lower limb exercises). This review found no significant effect of exercise on challenging behaviours or depression. A slowing of both cognitive decline and the development of dependence in ADLs is critical for enhancing the quality of life for people with dementia, and will have an impact on the family caregivers’ ability to sustain their caregiving role. The review suggests that exercise programs may have a significant impact on improving cognitive functioning and the ability to perform ADLs in people with dementia. In addition, the findings reveal that the burden experienced by informal caregivers providing care in the home may be reduced if they supervise their family member with dementia during participation in an exercise programme. Blankevoort CG, et al (2010) assessed the effects of exercise on physical function and activities of daily living in older people with dementia, 10 Randomised Controlled Trials with a total of 492 participants. Littbrand H, et al (2011) assessed the effects of exercise on physical function, cognitive function and ADLs in people with dementia. This review included only Randomised Controlled Trials and included a total of 10 studies with 622 participants. Martinez J.T. (2014) – a summary of 20 studies to improve cognition, neuropsychiatric symptoms and physical function in people with Mild Cognitive Impairment (MCI), dementia and AD. involving over 1,400 participants. There is also some evidence that individually performed walking exercise reduces decline in walking performance. It is valuable to note that no trials have reported adverse events related to exercise programs with people living with dementia. Working with people living in residential settings. What type of exercise and physical activity for people living with dementia? Evidence from the variety of studies currently available indicates the largest improvements are found after interventions of 12 weeks or more, and a frequency of 3 times a week with a 45-60 minute session. Other research has revealed that aerobic-type exercise has a clear benefit over strength training, and moderate intensity exercise of at least one hour a day, three to five times or more a week may be more effective in improving cognition. Further research is necessary to identify the optimal exercise modalities particularly in terms of frequency, intensity, and duration for people with different types and severity of dementia and to identify barriers and facilitators to improving adherence. There is no formal assessment on this course, but participants are given the opportunity for personal and professional reflection on their current practice and identify how the course content can enhance their future work as individuals or as a member of a team or service through an individual action plan. The one day course cost is £110 plus VAT per applicant and includes the Course Manuals and resources. If you want to host a bespoke course (£1,200 + VAT) in your area, please contact the LLT Office. You can apply online here, but first we ask that you ensure you have read the Eligibility Guidelines and the statement about Medical Conditions and Learning Support Requirements below. You should also have read the Terms and Conditions. Course dates can be found here. If there are no courses currently in your area we will initiate a course as soon as there is enough interest but we cannot guarantee a timeframe for this. If you are interested in hosting a 1st Steps in Dementia course in your area, just contact the LLT Office. View the Host Terms and Conditions here. The Dementia 1st Steps course is accredited on REPS as CPD (Continuing Professional Development). Therefore as a standalone qualification it does not give entry onto REPS. For many people that attend the Dementia:1st Steps course (eg. technical assistants and physiotherapists) they do not need to be on REPS as they are registered with either the CSP or the Health and Care Professions Council. If you wish to gain entry to REPS, you must first complete a course which gains entry onto REPS. LLT do not deliver any courses which gain entry onto REPS, only CPD for those already on REPS, or L4 courses for those who have the pre-requisite entry qualifications for REPS.
Join us on Twitter and promote Dementia Awareness.